It’s really hard time after finishing the waxing to settle down the bumps appeared on the skin. The bumps seem to be small and painless but gradually they turn to the something painful and it can be a tough time to deal with the time. We are introducing the very best remedies using natural ingredients to get rid of these annoying bumps. Make sure that do not ignore them at all otherwise it will become worst. Just wait for one or two day and allow them to disappear on their own. 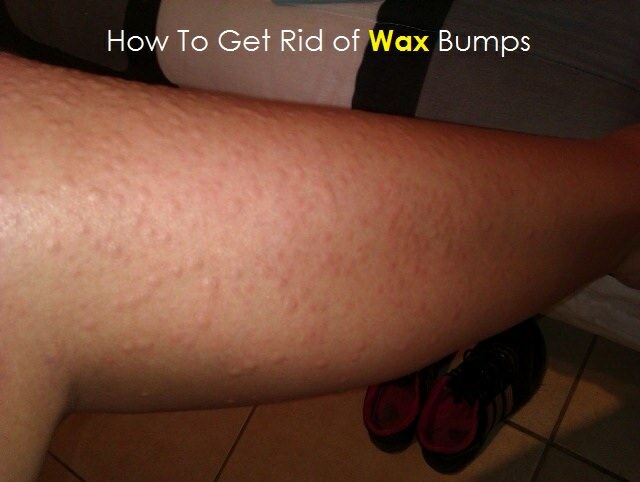 In case, if they don’t, immediately try out these remedies to get rid of these waxing bumps. What Causes Bumps After Waxing? Hair follicles are present in the skin so when these hairs are pulled in the opposite direction with the force while waxing, this causes tension on the skin. The first response of the body would definitely be the inflammation due to this stress. The swelling gradually becomes normal by itself in a day or two. The hair follicles at the time get infected and develop bumps filled with a liquid and white in color. If the bumps stay alive on your skin for a couple of days after waxing, it will give a sign on ingrown hair. What are the Best things to Get Rid of Bumps after Waxing? Aloe vera is used to treat the waxing bumps like on the chest, legs and the bikini area as it is soothing and useful for your skin. Inflammation immediately goes away after using this remedy. Not only this, but it also keep your skin moisturized and hydrated for a long time. Take a long enough leaf from an aloe vera plant. Slice the leaf near to the sides and extract the gel from it. Transfer the gel to an airtight container. Apply some amount of this fresh gel on the bumps and massage a little. Store the remaining gel in the container and keep it in a cool place. Tea tree oil is the best oil for all the skin related problems as it is helpful in preventing the infection due to presence of the antibacterial, antifungal and antiviral properties. It also speeds up the healing process. Mix 3 drops of tea tree oil with 1 tsp of olive oil. Apply this mixture to the affected part of your skin and massage with the gentle motion of your hands. Massage for at least two minutes until it gets absorbed into the skin. Apple cider vinegar is a best remedy for bumps on the face and bikini. It contains antiseptic and astringent properties that are proven to be beneficial for this case. It helps in balancing the normal pH level of your skin and reduces the inflammation and itching. Dilute apple cider vinegar by mixing 1:1 ratio of water in it. Apply this diluted mixture on your affected area with the help of a cotton ball. Let it dry on its own for 10 minutes and after that rinse it off with the cold water. Remember the coconut oil should be organic for this purpose. If you apply this oil directly on the inflamed skin, you will see the surprising result that how it works greatly over the bumps. Along with this, it keeps your skin moisturized and its antioxidant property recovers the process of the skin after the waxing session. After waxing, first cleanse your skin with a mild cleanser. Pat dry the skin then apply organic coconut oil to the waxed areas. Leave it for as long as you can. Reapply the coconut oil every time after taking bath. Witch hazel is excellent remedies to keep your skin soothes and supple for a long period of time. It contains antiseptic, antibacterial and anti-inflammatory properties. Try to use witch hazel for the white bumps that are usually formed on the upper lip after waxing. Dip a cotton ball in a witch hazel solution and apply on the area that has been waxed. Let it dry and make sure you do not need to rinse this off. Do this remedy twice a day. Do not apply some of these remedies immediately after waxing as few of the ingredients described above has the stinging effect that will be itchy and unbearable for you. Take a gape for few hours and then do the process. Exfoliate the skin before you wax or shave. Use a baby oil to help clean up residual wax, it also moisturize the skin. Wipe your skin with tissue or use neat and clean cloth after waxed or shaved. Avoid waxing during menstruation or pregnancy because our skin becomes more sensitive to cuts and bruises. Apply grape seed oil or coconut oil after wax or shave as it helps to reduce pain and provides comfort. It is always good to apply ice on the skin to calm the inflammation and redness. Avoid picking or popping bumps.